Buildings are responsible for almost half of the energy consumed in the United States. Nearly 90% of that energy is associated with building operations that occur after a building has been constructed. In a previous discussion on our Idea Cloud, we explored implications of long-term thinking and what that meant for buildings. If we can conceptualize buildings as 50, 100, or 200 year assets, we can start to see the multitude of synergistic benefits that long-term thinking can provide, especially in terms of a building’s energy use. In addition to reducing operational costs and minimizing harmful environmental impacts, reducing building energy consumption can provide significant returns on investment, promote the health and wellbeing of building occupants, optimize working conditions, and provide a lasting asset to communities. 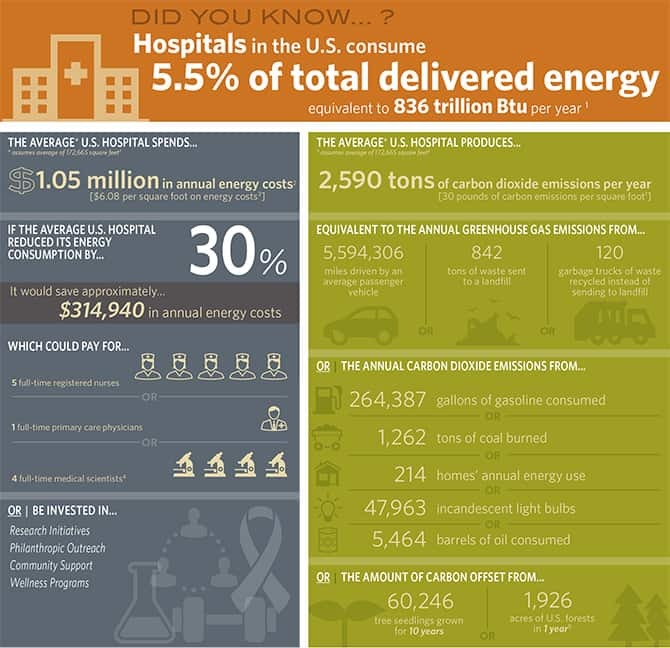 Hospitals, often seen as long-lasting community assets, are the second highest consumer of energy by building type, accounting more than 5 percent of all energy used in the U.S. yet accounting for only 1 percent of all commercial buildings. They consume about 2.5 times more energy than a similarly sized office building. As the cost of energy continues to rise so to do the prospects for a health care organization’s operational costs. Click here see a larger version of the graphic. Simultaneously, hospitals are under an increasing amount of pressure to be more cost efficient while improving the quality of services that they offer to patients and their communities. 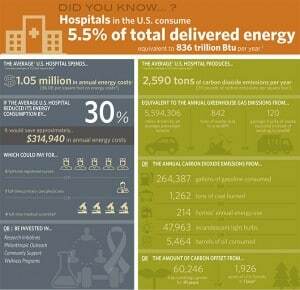 In this economic climate, reducing energy consumption goes beyond environmental stewardship; it goes right to an organizations ability to service its patients. Much of a hospital’s energy demands are associated with the complexities required to provide quality care, including technical sophistication, complex building program, 24/7 operations, and major HVAC demands associated with infection control and hazardous chemical usage. 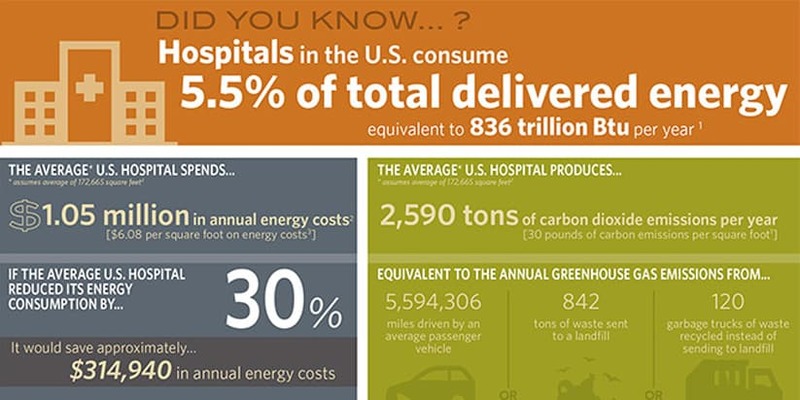 While the up-front costs associated with high performance buildings are generally greater than more conventionally designed buildings, there are opportunities for health care institutions to capitalize on the cost savings associated with reducing a building’s energy consumption. As the accompanying graphic shows, potential savings in both energy and money can be surprisingly significant. As health care organizations in most communities, especially smaller cities and towns, are a leading economic driver in their community, the ripple effect from cost efficiencies can spread well into the community as well as set a new standard of operation for others to follow. The service demands of a hospital make it a complex design and a mechanical challenge. For all of its complexities, though, it is the dynamic nature of the facility that affords it opportunities to create synergy between mechanical systems and balance the needs of the hospital. Through mechanical design strategies, hospital can achieve the energy and costs targets cited. An upcoming Idea Cloud blog post will explore these some of these strategies.